Ok so...I know I haven't posted much of anything lately. That's because I've been working on a Pacing Guide to use this school year. I wanted to make it editable so once I shared it, you could change whatever you needed to in order to fit your needs. 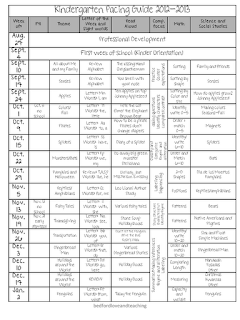 We all know this time of year gets crazy as we start to think about back to school, so I hope this Kindergarten pacing guide FREEBIE is helpful to you and your colleagues. I have done something like this every year with my teammate...but since I am going to a new school I thought I'd come somewhat prepared. I was heavily influenced by Kinder Kraziness' guide which you can find here. I was also inspired from Lil' Country Kindergarten, which you could find here. I added a place for read-alouds that I thought would go best for the theme for that week. I saved this Kindergarten pacing guide freebie as a powerpoint file but if that doesn't work out for you, just send me an email and I can work out something else. 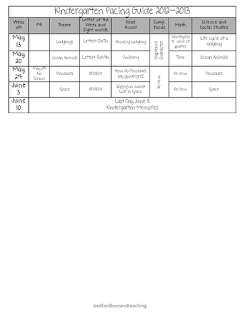 When you click on the pictures below you'll see my entire Kindergarten pacing guide freebie. 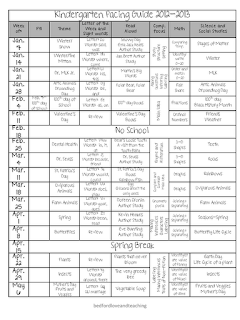 It includes columns for misc school information (such as days off), theme, letter of the week, sight words, our read aloud, our computation focus for the week, math, and whatever we happen to be working on for science and social studies. Obviously - just like all things in teaching - this is a fluid document that can and will change throughout the year. However, I feel much better knowing everything has been well thought out before my students even walk into school! Click to get your Kindergarten Pacing Guide FREEBIE! Is there anything you would add to this Kindergarten Pacing Guide FREEBIE? I'm always on the lookout for great ideas to implement in the future! Thank you so very much! This is awesome! This is so super! YOu are so wonderful to share with us. hugs!